Potential and experienced stunt judges gather in Auburn for the clinic; at right, a group discusses appearance judging of Mike Haverly's plane. Tim Wescott photo. Ten judges and prospective judges from the Pacific Northwest showed up for the Skyraider's judging clinic at the Skyraiders field. The Northwest Skyraiders and Bruce Hunt put on a stunt clinic for Northwest judges and pilots. The day consisted of a "ground school" conducted by Bruce, where he explained the system of judging used at the Nationals, and went over common errors in the Control Line Precision Aerobatics pattern, how to see them and how to judge them. After a break for lunch, Mike Haverly and Howard Rush put up flights, which the judges scored and critiqued. Attending the event as judges were Tom Brightbill, Chris Cox, Joan Cox, Robin (Wescott) Gearn, Steve Helmick, Robbie Hunt, Alan Resinger, Tim Wescott, Mark Winz, and Keith Varley. Bruce Hunt was the instructor. Mike Haverly and Howard Rush put up flights for us to judge, and Mike Potter of the Skyraiders helped out with gate-keeping duties. The weather was cool and sunny, with no threat of rain. The wind, however, made the day far from stunt heaven. The wind was strong and gusting from the north. While it wasn't a strong enough wind to make every flight was a white-knuckle business, it was still strong enough that one had to worry a bit about one's plane. In spite of the wind, Mike and Howard were good enough to put up one flight each. All in all, the clinic was a good one, and participants seemed to feel that it was a day well spent. 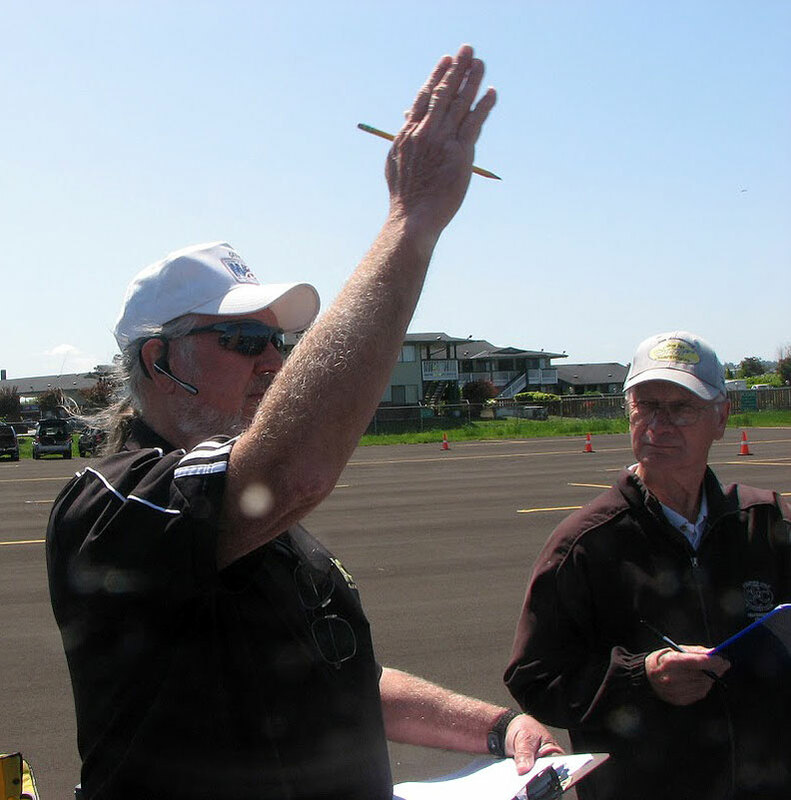 Instructor Bruce Hunt discusses maneuver analysys as Alan Resinger looks on. Tim Wescott photo.